This archive holds all posts form November 2012. Sundays are for relaxing and avoiding any real critical thinking beyond which outdated sweatpants to wear, right? I would normally agree, but a 60 Minutes episode airing on CBS on November 18, 2012, one of the last remaining venues of real journalism within the U.S. market broke the silence in my mind. A piece entitled, Born Good? Babies Help Unlock the Origins of Morality, evoked my lazy carb induced Sunday evening mind to contemplate. Leslie Stahl sought to answer the questions if we as humans are born to be good or bad? Do we start out in life with a sense of morality, selfish, and or oppressive? Or as many have over time believed, such as B.F. Skinner simply blank slates which are in need of guidance from society to fill the voids? there is a universal moral core that all humans share. The seeds of our understanding of right and wrong are part of our biological nature. In terms of what some may call “evil,” the findings from the lab have pointed to evidence which proves that babies are born with a sense of bias and preference for individuals who have similar traits and characteristics that they as babies possess. Simply, babies are predisposed to divide and categorize the world up into groups. But the research that proved babies prefer individuals who harm others unlike them was the point within the televised show which pushed me to sit up and take real notice. If one believes in the findings, on one hand we are essentially we are genetically wired to know and value justice and equity, but on the other we have a calling to protect our own through the means of dividing and conquering. Even though people such as Dr. James Anderson have argued that the term race and acts of racism did not emerge until the 18th century, Bloom noted that “evolution” dedicates at least the need for humans to categorize individuals and thus be weary of those unlike them was necessary in order to survive. This he feels is the key to understanding how to exterminate racism and bigotry that is acted upon throughout the world. Moreover, the call for society and positive nurture is needed to combat these biological callings. This was shown in the 60 Minutes piece to be true as researchers worked with older children (9 to 10 years of age) and proved categorized evil traits of humanity could be tempered due to education and positive inculcation. Even though the Wynn and Bloom’s research initially argues that babies and young children are genetically predisposed, on an elementary basis, to prefer others like them, while at the same time punishing others unlike them, the researchers also illustrated that the feelings that drive these actions can be corrected to a large degree with positive societal and family guidance. What are the true sociological implications? I feel that attention and research is needed to the possible linkages of “evolution” and public policies. A better picture as to why historical and contemporary policies that oppressed and or harmed specific marginalized populations throughout the world can thusly be created. The implications of said research can also explain why racial persecution continues today within the 21st century. In addition, scholars within the field would be able to add another layer of explanation as to the motivation for the precursors to said policies. Next, by investigating the nurturing aspect of specific people and or groups responsible for the oppression of others could lead to a better understanding into the actions of man. Moreover, by applying the findings of Yale’s baby lab, researchers are able to explain the differences in our social, economic, and educational realms. Most importantly, I feel it also sways a large degree of responsibility back, not only onto the self in regard of self-control and rectification, but also onto those within our individual environments. Spielberg’s Lincoln Movie: Yet More White Saviors? What is so odd about this film—and something I would not have anticipated from Masur’s op-ed—is that it really is trying to show that abolition is the democratic project of the 19th century. Democratic in its objective (making slaves free and ultimately equal) and democratic in its execution, involving a great many men beyond Lincoln himself, and a great many lowly men at that. But it is a white man’s democracy. In the film, in fact, Lincoln tells his colleagues: “The fate of human dignity is in our hands.” Our hands. Not theirs. The inclusion of so many white players makes the exclusion of black players all the more inexplicable—and inexcusable. It’s just a weird throwback to the pre-Civil Rights era except that emancipation is now depicted as a good thing—just so long as it is white people who are doing the emancipating. I sometimes ask my students and colleagues, “who freed the slaves?” Most people say the Emancipation proclamation or Lincoln. Actually those “black players,” the 210,000 black Union soldiers and sailors and the 300,000 black Union support troops played the biggest role in many ways, yet get almost no attention in mainstream accounts of a typically white-centered Civil War. Not to mention the great “strike” of black labor against the treasonous Confederate slaveholders, the black laborers who fled slavery to the North or who sabotaged the plantation economy during the war. Please add your thoughts on this “blockbuster” movie, especially if you have seen it. As a byproduct of the recent presidential campaign, a troubling and explicit depiction of China as the primary source of America’s recessionary loss of jobs and economic woes reached a new level. A video presented by in stark black and white tones by the Citizens against Government Waste (CAGW), a fiscally conservative non-profit organization, creates a sense of impending doom by portraying America’s future failure to China’s economic insurgency. Set in Beijing in 2030 A.D., this politically-based video is in Chinese with English subtitles and shows a meeting of Chinese citizens held in Beijing led by a Machiavellian-like Chinese leader. The sinister-looking leader attributes America’s failure to spending and taxing itself out of a great recession through enormous “stimulus” spending, massive changes to healthcare and crushing debt. He derisively declares, “Now they work for us,” while the Chinese audience laughs appreciatively and gleefully. On day one, I will label China a currency manipulator which will allow me as President to be able to put in place if necessary tariffs where I believe they are taking unfair advantage of our manufacturers. So we are going to make sure the people that we trade with around the rules are playing by the rules. Karabell points out also that this trend has occurred in other presidential campaigns: in 1992, Bill Clinton accused President George H.W. Bush of coddling Chinese dictators, while in 2004 John Kerry called corporate leaders “Benedict Arnold CEOs” for shipping jobs to China. What is worrisome about this anti-Asian virulence is the possible return to historical animosity toward Americans of Asian descent that expressed itself in Anti-Asian legislation and actions over more than a century. Recall the so-called “yellow peril” ascribed to the influx of Asian immigrant labor to the West coast in the 19th century and the resulting Chinese Exclusion Act of 1882 that that sprang up in response and was not repealed until 1943. Or the wholesale internment of 100,000 Japanese Americans in camps during World War II. Note also in the present-day example the lack of accountability ascribed to American corporations who have chosen to outsource work overseas, in search of cheap labor and greater profitability. While clearly the Chinese Communist government represents the antithesis of American democratic practices toward its people, the “rise of the rest” as Fareed Zakaria puts it in The Post-American World means that globalization is creating a new and highly competitive economic playing field. Tom Friedman in his famous book, The World is Flat notes that the current phase of globalization will be driven by a diverse group of individuals likely to be non-Western and nonwhite. In Bridging the Diversity Divide: Globalization and Reciprocal Empowerment in Higher Education, Alvin Evans and I describe globalization as a catalyst and mandate for remedying underrepresentation and achieving greater inclusion in our American institutions. If the U.S. focuses on nurturing the optimism, drive and skills that yield . . . results in the 20th century, it will thrive; if Americans obsess about looming threats from the East, it may indeed enter the economic twilight. The choice is ours. In this era of globalization, the strength of our demographically diverse nation lies in our ability to rise above the distinctions of race, ethnicity, gender, sexual orientation, and disability to achieve success. When mischaracterizations and exaggerations occupy our mindsets and airwaves, then we are less able to draw upon the strength of our representative democracy, the capabilities of our diverse citizenry, and our capacity for innovation. With the re-election of President Obama, white people who rooted for the other guy took to various forms of digital media and unleashed their disappointment. Some white folks went a good deal farther than disappointment into overt racism, like this white woman from California who posted her racism on Facebook. Jezebel pulled together a rogues’ gallery of racist tweets. The gallery at Jezebel prompted some geographers to create a map of all the racist tweets. The enterprising folks at Floating Sheep used software they created called DOLLY to collect geocoded tweets for the week beginning November 1. In other words, it’s possible to search Twitter by both location and key word (some other examples here). If I understand it correctly, the DOLLY software allows this search process to be further refined to get data at a more granular level. What they came up with is a map that allows us to understand, at a glance, how these everyday acts of overt racism are spatially distributed in the U.S. This is valuable work and just the kind of thing that I’d think sociologists would be interested in doing (but I digress, slightly). The methodology here, buried in the footnotes on the original post, is a worth exploring a little further. Based on this, they assign a number, or a Location Quotient (LQ), for “Post Election Racist Tweets.” They then rank order states based on their LQ’s. The results they end up with (Alabama, Mississippi, Georgia end up with 3 highest LQ scores) are less interesting than their map and clever methodology. In their analysis, the writers do well to note that the “prevalence of post-election racist tweets is not strictly a southern phenomenon,” but the ranking of the LQ scores by states makes the opposite case. I want to suggest here that the problem is two-fold: 1) the way the research question is posed and 2) the state-level of analysis. The researchers here frame their question in terms of state boundaries and posit something of a false dichotomy between “even distribution” of racist tweets on the one hand, and, “states that specialize” in racist tweets on the other hand. As anyone who has taken an undergraduate methods class can tell you, this research question shapes the kind of data collection you do, and the analysis you come up with at the end. The state-level of analysis here is something of a distraction. I understand that since we just went through a presidential election, people are thinking in terms of “states” – swing states, blue states, red states, who carried the state – but here, it makes less sense. What I see when I look at this map are population centers. Take my home state, of Texas. The red dots there are clustered around places where there’s population density – Houston, Dallas, and more along the I-35 corridor. And, compare that to where I live now, on the East Coast. There are red dots all along the Northeast corridor of I-95. At a glance, it looks like racist tweets are not evenly distributed across the U.S. but are concentrated where white people live. Again, let me say, I appreciate this work immensely, but I think that the state-level questions are the least interesting, and ultimately least revealing set of questions for mapping racism through digital media. Instead, I’d be interested in seeing some other basic demographic info about percentage of white people in the population and the proportion of racist tweets. My guess is that the LQ is highest where there is the highest proportion of white people, but that, as academics are so fond of saying, is an empirical question worth investigating. More in posts to come on calling out racism in digital media, and the growing backlash against it. Moving Towards a “Post-Racial” Society? Not Really. Based upon the results from Tuesday’s election, are we in post-racial society? As Joe pointed out in his post after the election, of course not. I will take this one step further: is U.S. society coming closer (if not there yet) to being a “post-racial” society? The exit polling from the election Tuesday suggests not. In fact, a preliminary look at the numbers suggest something rather disturbing: that white Americans are beginning to consolidate their support behind the (white) Republican candidate, regardless of a variety of factors. When interviewing white college students, a common claim I found was that U.S. society is getting more progressive due to the impending deaths of the old racist whites. However, exit polling from the election and comparing it to what happened in the previous cycle (see here), we find that all of the President’s losses were among various groups of white voters, including young white voters. As Joe pointed out earlier, President Obama lost whites aged 18-29 by a margin of 44 percent to 51 percent. This was a complete reversal of 2008, when then Senator Obama carried the same group of voters by a ten-point margin (54-44). Meanwhile, white women’s support for the white Republican candidate this time doubled its spread from 46-53 in 2008 to 42-56. Meanwhile, Independent voters also flip-flopped from supporting Senator Obama 52-44 in 2008 to Romney 45-50 (note: the first number listed is President Obama’s on the chart below). This rejection of President Obama by white America was quite extensive. We must push back against the MSM to paint a distorted picture of how this man won re-election. Besides young voters and women, Catholics is another group the MSM could generalize and say “Catholics supported Obama by a 50-48 margin…” The reality is that white Catholics overwhelmingly rejected President Obama by a 40-59 margin, while white Protestants were even worse at 30-69. After a far too brief look at the exit polls, I see incredible support for the President coming from Blacks and Latinos (considering that the turnout was actually down from 2008 and 2004, see here), and his campaign did a great job of maintaining support among the Party faithful (he won Democrats 92-7) while convincing enough voters that he cared more about them than Romney did (he won those earning below $50,000 60-38). What we race scholars should be focusing on is the disturbing gap among our young people (e.g., nearly one-third more Latinos 18-29 supported Obama than whites in the same age cohort), and the consequences of such a major gap. This is a very interesting time to live in this country, indeed. We just re-elected the first African American president, Barack Obama, yet he is a man who has for the most part carefully avoided talking about issues of US racism in order to win twice. He often provides the country with the colorblind rhetoric from the soft version of the white racial frame, even as he strengthens and expands, often quietly, much of the civil rights protection and enforcement neglected by his conservative predecessors. I have been looking in some detail at the exit polls for the second edition of the Yes We Can? book that Adia Harvey Wingfield and I are trying to get out soon, and they are very interesting. In the 2012 election Senator Obama won an estimated 50.8 percent of the total popular vote (when all is finally counted), compared to 52.9 percent in 2008. This resulted in a likely 332-206 electoral vote victory (including Florida, which is still counting), lower than the 365–173 figure for 2008. According to the exit polls whites made up 72 percent of total voters in this election, down a bit from 2008. Whites gave Obama a lower percentage of their votes (39 percent) than they did John McCain in 2008 (43 percent). Romney got a majority of the white vote nationally and also in all but one (New York, barely an exception at 49 percent) of the 18 major states in which exit polls were also conducted. About 89 percent of those who voted for him were white. A close look at exit polls indicates that Obama lost all the white age and gender groups. Media discussion of his winning the youth and female vote are quite misleading, because it was the youth and women of color who provided the majorities for him, not whites. Indeed, Obama only got 44 percent of whites under 30 and 42 percent of white women. Obama lost these white age and gender groups by substantial percentages, most dramatically getting only 35 percent of white men. It was, again as in 2008, voters of color who provided the margin of victory for Obama, and their percentage of the electorate increased from about to about 26 percent in 2008 to 28 percent in 2012. Black voters gave him 93 percent of their votes; Latinos, 71 percent; Asian Americans, 73 percent; and others of color about 58 percent. The percentages for Latinos and Asian increased significantly from their 2008 percentages of 67 and 62 percent respectively, while the huge black percentage was down just a little from 95 percent in 2008. So the overwhelming majority of white men and a substantial majority of white women went for the Republican Party, and lost this one rather significantly, at least in the (undemocratic) institution we call the electoral college. I have not seen a tabulation of the new congressional figures for next year’s new Congress, but in spite of some moaning by white male commentators on the right about the “loss of the country,” white men still control Congress overwhelmingly. The current 112th Congress, like all previous congresses, is disproportionately and overwhelmingly white male. In this 2011-2013 Congress, the Senate is 96 percent white in composition, with just two Latino, two Asian American (both from Hawaii), and no black senators. Some 81 percent are white men. The House is 83 percent white in composition, with 72 percent of members being white men. In addition, the very top political leadership of the U.S. Congress and the White House has for centuries been white male–with only two rather recent exceptions (Barack Obama and Nancy Pelosi, both in the 2000s) since the country’s founding. Also, in the economy, whites, and mainly white men, have dominated the major institutions to the present day. About 95 percent of CEOs of Fortune 500 firms are still white men. And among Forbes magazine’s 400 wealthiest Americans, those worth at least a billion dollars, 86 percent are white men. A modest loss of some political power seems to mean a “loss of the country” for many of these folks. Henry Olsen, vice president of the conservative American Enterprise Institute, has a very detailed statistical analysis of the polls and predicts that President Obama will win tomorrow. He presents a detailed argument on no less than the National Review online, the programmatic heir of a racist white conservative tradition started by William Buckley, Republican intellectual and supporter of Jim Crow segregation and South African apartheid. Olsen accents the extraordinary whiteness (especially southern whiteness) of the Republican Party and the 2012 vote, with an omission of the long historical context that other analysts of politics and racism like me have provided, but his conclusions are fascinating and must be very disturbing to Romney’s loyal base. He, not surprisingly, does not dig into the systemic racism of the past or present that lies behind his statistical figures. Win or lose, we are in the twilight of the Age of Reagan. Romney’s efforts have almost recreated the Reagan coalition, but in today’s America that is no longer enough. To prevail in 2014 and beyond, the Republican party will need to learn to adapt its principles to new times and new voters. Echoing Rabbi Hillel, Reagan summoned conservatives to action with two related questions: If not us, who? If not now, when? We must take on this challenge anew as we undertake our rendezvous with destiny and remake the conservative majority Reagan bequeathed to us. By new voters, he means the voters of color who are likely to make up more than a quarter of tomorrow’s voters, and increasing percentages in the future. The 2012 election is shaping up to be more polarized along racial lines than any presidential contest since 1988, with President Obama experiencing a steep drop in support among white voters from four years ago. The slippage among whites is something of a setback for Obama, who campaigned on bridging the racial divide in his election and has sought to minimize rifts that have arisen in his presidency. The reasons for this mixed-state-national pattern include not only Obama administration actions benefiting certain northern white worker-voters (for example, the auto industry bailout) but very substantially the fact that voters of color are still very strongly in Obama’s political corner. As Adia Wingfield and I have underscored (in a book whose second edition will be out in the spring), Obama succeeded in the 2008 election substantially because he got overwhelming majorities of voters of color–two thirds of the Latino vote, nearly two thirds of the Asian American vote, and more than two thirds of the Native American vote. He is polling very well among these groups in 2012 surveys as well. Dismal support for Republicans among minorities is a long-term problem for the GOP in a rapidly diversifying nation. Fully 91 percent of Romney’s support comes from white voters. Whatever happens Tuesday, the obvious politicized whiteness of the Republican Party will doom it eventually to permanent minority status, if the dramatic trend to whiteness is not soon curtailed. My party, unfortunately, is the bastion of those people — not all of them, but most of them — who are still basing their positions on race. Let me just be candid: My party is full of racists, and the real reason a considerable portion of my party wants President Obama out of the White House has nothing to do with the content of his character, nothing to do with his competence as commander-in-chief and president, and everything to do with the color of his skin, and that’s despicable. Perhaps the most significant aspect of the mainstream discussions of these white voting patterns is how seldom they even note, much less analyze, the centrality of systemic white racism in making sense of the great hostility and organized opposition of many white voters to President Obama. This white racism is not new, nor is it just about some white bigotry–for it signals much more in the way of white racial framing of the society, and of white fears and anger over racial and demographic changes currently underway in the country and likely to be more dramatic in the near future – an argument I have developed extensively in my recent book, White Party, White Government. There, too, I show how, from the beginning of U.S. political parties, that systemic racism has been central to their development, strategies, and efforts on U.S. society. Even in this “land of the free” and well into the 21st century, there are numerous aspects of our undemocratic political-economic system that are not openly discussed and extensively analyzed in mainstream settings, especially by whites, including most in the white elite. Very revealing, itself. 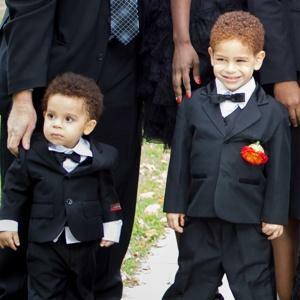 Connor and Brandon Moore, ages 4 and 2, are believed to be Hurricane Sandy’s youngest victims. They were swept out of their mother’s arms by the storm. When I first heard reports of this story, I couldn’t make sense of it. The news reports said that the boys’ mother, Glenda Moore, had been “denied refuge.” Why would this happen? How could this happen? Then, reports came that their mother – the woman asking for refuge from the storm – was black (the boys’ father is white but wasn’t there). And, then the story seemed to come into a horrible kind of focus, that implicated racism. This story is being compared to the infamous ‘Kitty Genovese’ story from years ago in New York – when a young woman was stabbed to death and her neighbors did nothing to help. The not-often-told part of that story is that Kitty Genovese was a lesbian, and that’s part of why her neighbors didn’t call police on her behalf. Her status as an ‘Other’ (lesbian) made her seem less-than-human to her neighbors. This week, in Staten Island – the ‘fifth borough’ – people there, if reports are accurate, were blinded to the humanity of a mother and her two young sons because of racism. Ultimately, racism blinds us to our shared humanity, keeps up from seeing each other as fully human, and in need of each others’ help. This time it cost two young lives, and we are all little less for it.